Since the age of 8, I’d always hunted with my dad in a swampy area of my hometown in Apulia Station, New York. Big bucks were rarely seen, but it never stopped me from spending as much time as I could out there bow, shotgun, and muzzle loading seasons. I had no idea that my dedication to the sport would pay off in such an amazing way, 23 years later. I married into a farm family who had practiced Quality Deer Management for many years, and I’d seen my brother-in-law take some pretty amazing deer. There were many mornings that I didn’t see a thing, but the morning of December 11, 2010 just felt different. It had snowed for a week straight and we had a storm on the way, I thought it was the perfect time to head to an old stand located on the edge of a patch of apple trees. I knew there was a chance the deer would be feeding there, the area had been fresh with tracks all through bow season. It was no more than twenty degrees that morning, so I was happy to have my Arctic Muck boots and warm, water resistant Realtree and Mossy Oak camo. Getting up the hill through snow over two feet deep wasn’t easy, but I made it to the stand at 6:45, just before sunlight. Having never been in that stand before, I wasn’t sure what kind of shape it was in. I found a good spot on the ground with sufficient cover to break up my figure while still allowing me the ability to shoot; something my father had taught me many years ago. After about an hour of checking it over, I deemed the stand safe enough to use. Other than a couple doe running past me, it was a fairly calm morning- the wind was only blowing enough for me to smell corn silage in the bunks just east of me. I had been in the stand for a little over an hour when my phone started to go off, my wife was texting me; far more worried about our sick cat than the fact that I was trying to stay quiet and still. As I text her back that I’d be sure to check on the cat when I got home, something caught my eye from the north. My body was facing away from it, so I slowly turned to see what it was. I could tell it was a buck, definitely one worth taking, he was moving quickly towards the south on my right side, through the thick of the apple trees. Reaching for my Simmons binoculars- I caught sight of what was by far the largest whitetail buck I had ever seen. I waited until he reached a small clearing; I fired one shot at approximately forty-five yards and he dropped to the ground. After a few minutes I saw him trying to get up. I fired twice more, missing both times due to the fact that I was shaking so badly. I climbed down from my stand and loaded my Remington 870, twelve gauge, with five Winchester super X 2 3/4" slugs. I got near enough and, despite my shaking, finished him with a fourth shot. What lay in front of me was like nothing I’d ever seen before, at least not in the flesh. 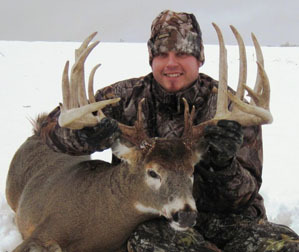 A true whitetail monster, his sixteen points measuring about 205 inches green gross. I immediately text my wife to tell her I’d just taken the buck of a lifetime; her response being "Yeah right, liar." However, she had enough faith in me to call her father and tell him I’d shot something and may need help getting it off the hill, his jaw dropped when he saw what I’d killed. His land has been the home of many remarkable bucks over the years, but this was by far the biggest. Weeks later, jaws are still dropping at the sight of this trophy- and I still have to pinch myself to make sure it’s real at the end of the day. I’ll never forget the way it felt to take one of the biggest bucks New York has ever seen.